College Court Hotel & Conference Centre Conference CentreWith a great range of facilities, tranquil setting and excellent transport links, College Court is Leicester's leading conference and events venue. Our guests are able to benefit from a wide range of different conference spaces, perfect from 2 to 160 delegates, fine dining in the College Court Restaurant and a restful and relaxing stay in our 123 bedroom Hotel. 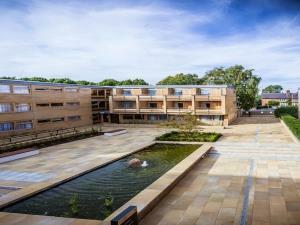 Located just minutes from Leicester's vibrant City Centre, College Court is a haven of tranquillity, surrounded by established trees, landscaped gardens and quiet residential streets. Inspired by our surroundings, we have named each of our conferencing rooms after the many different varieties of tree on the site and our restaurant boast dishes that echo the iconic sixties design of College Court itself. Conveniently located within easy reach of the M1 and M69 motorways and only 1.7 miles from Leicester Train station, where guests can travel only 70 minutes from central London. East Midlands Airport is also located less than 30 minutes away and Birmingham International Airport only 45 minutes. College Court is the perfect place for your conference, wedding, or stay in Leicester. We want each of our guests to get the very most from their time with us and we are happy to discuss the different conference packages and options we offer. Please contact a member of our team to book your conference, event, celebration or wedding at Leicester's most iconic venue. With a great range of facilities, tranquil setting and excellent transport links, College Court is Leicester's leading conference and events venue. Our guests are able to benefit from a wide range of different conference spaces, perfect from 2 to 160 delegates, fine dining in the College Court Restaurant and a restful and relaxing stay in our 123 bedroom Hotel. Balconies on selected bedrooms, giant board games, onsite walking path, Arboretum access, outside terraces Children welcome from any age. reach of the M1 and M69 motorways. Please use the postcode LE2 3TQ or Knighton Road, Leicester when using a SatNav device. College Court offers ample complimentary car parking spaces, including designated disabled bays. Access is available from Knighton Road and barriers control access to and from the car park. For further information on how to find us by train, bus, bike or on foot please contact us for our Travel Guide.